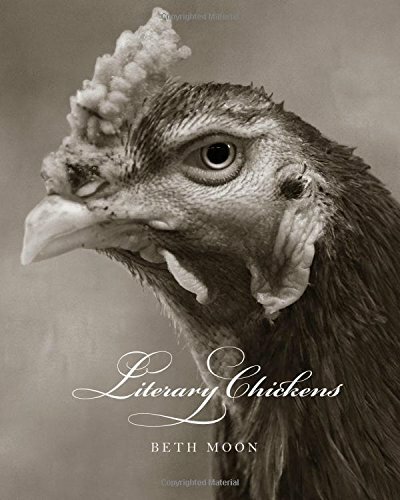 Literary Chickens is a paradoxical curiosity inspiring invitation to a collection of photography. Hats off to Beth Moon, an imaginative photographer, for her creative vision. Moon’s distinctive take on all that is chicken transcends mundane discussion regarding number of eggs laid, tasty recipes, or meat color preference. The savory artistic images juxtaposed with delicious literary vignettes achieve a sensory home run in successfully marrying offbeat subject matter with polished portraiture. Beth Moon photographs an array of chicken breeds all with different physical characteristics. Anointed with mysterious and glamorous sounding monikers such as Silkie Bantams, Frizzles, Salmon Faverolle, Australorps, Buff Orpingtons, and Rhode Island Red Hen, these creatures are differentiated by exotic plumage and intricate feather patterns. Moon’s depictions recall a society doyenne from a John Singer Sargent painting as her distinguished chickens appear in regal stance decked out in flamboyant finery. Photographic technique also contributes to the aura of Moon’s work. The images are abstracted to produce lovely tones of warm black, soft gray, and brown, a softening effect that infuses each portrait with earnestness and gravity. The literary infusion comes in juxtaposed passages from classic literature by renowned authors including Beowolf, Machiavelli, Virginia Woolf, James Joyce, Edith Wharton, L. Frank Baum, and others. These excerpts are a thoughtful complement to the imagery that effectively advance Moon's objective to elevate the readers’ thinking about chickens, nature, and overall perception of the world at hand. Beth Moon is a gifted photographer with abundant creative insight and an eye for unconventional subject matter. Literary Chickens delights the eye and arouses the mind.